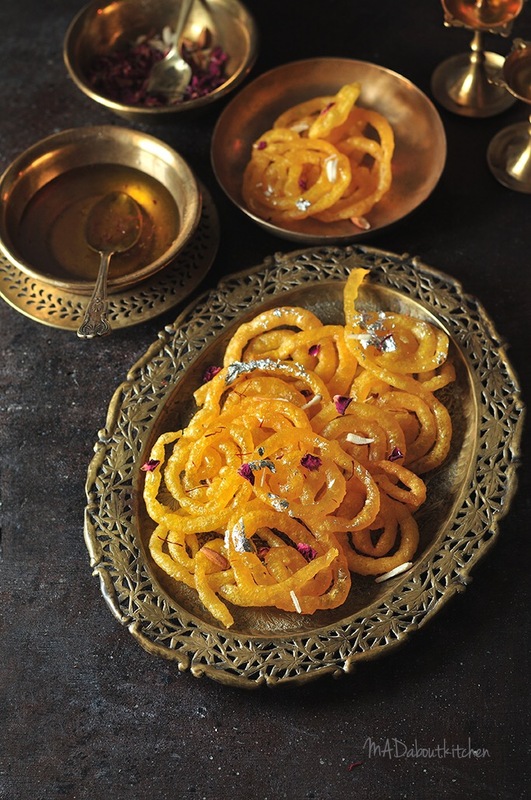 Jalebi is one of my favourite sweets amongst all other Indian sweets. 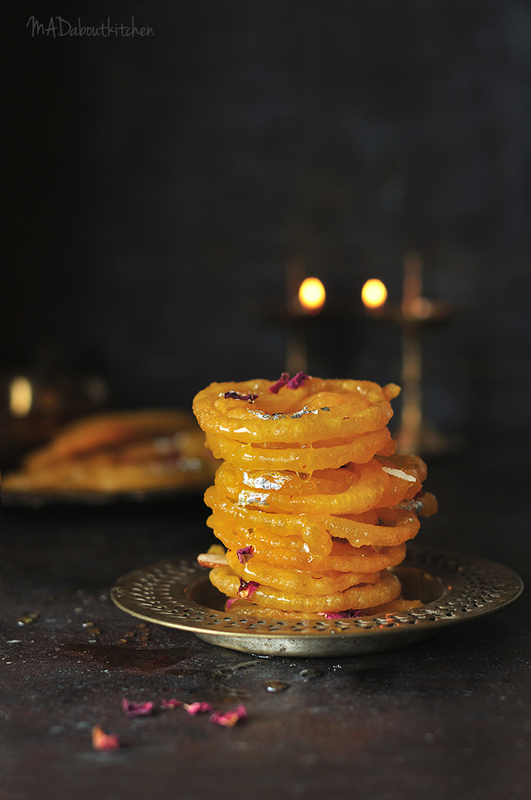 These crisp swirls , dipped in sugar syrup just taste heavenly. Have it hot, have it with rabadi, have it poha, have it any way you want and it tastes out of the world. 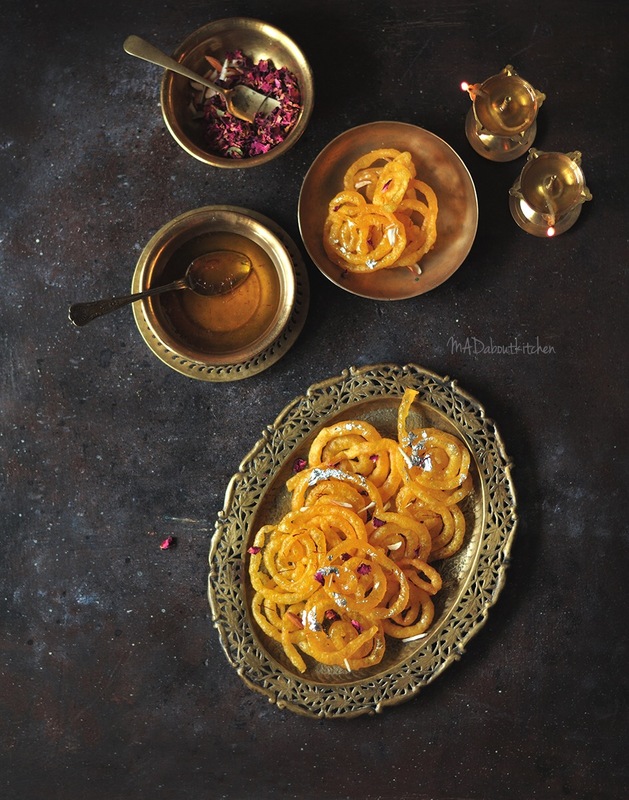 Jalebi is always considered tough to make, and hence I never attempted making them. This Diwali i took it up as a challenge and i was so surprised and pleased with the results. The shape might not be perfect, but i am more than happy with them. Finally what matters is the taste. Isn’t it??? 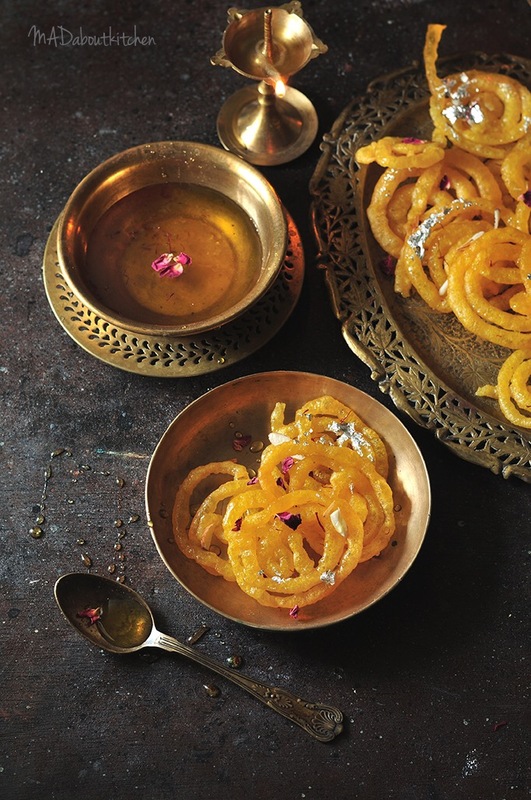 Jalebis are pretzel shaped which is crispy and juicy outside and chewy and soft inside. Silver warq, dry rose petals and Saffron for garnishing. In a huge bowl mix maida, water and curds and beat it and whisk it with your hands for 10 minutes. Incorporate as much air as possible. Cover and leave it in a warm Place for 24 hours. Atleast 12 hours but preferably 24 hours. After 24 hours, add 2 tbsps of maida and beat it with your hands well for 10 minutes. Add yeast, give it a good mix. The batter will now seem very elastic. Leave it to rest for an other hour or two. Before we start making jalebis make the syrup. For the syrup start boiling water and sugar together. Add crushed saffron and a lemon wedge into it. And let it boil. Because of the lemon wedge, any dirt in the sugar will start floating on top of the syrup. You will see a whitish curdled dirt forming a layer. Carefully scoop it off and discard it. Let the syrup boil and reach one thread consistency*. Keep the syrup warm. Heat oil for frying the jalebis in a shallow pan. 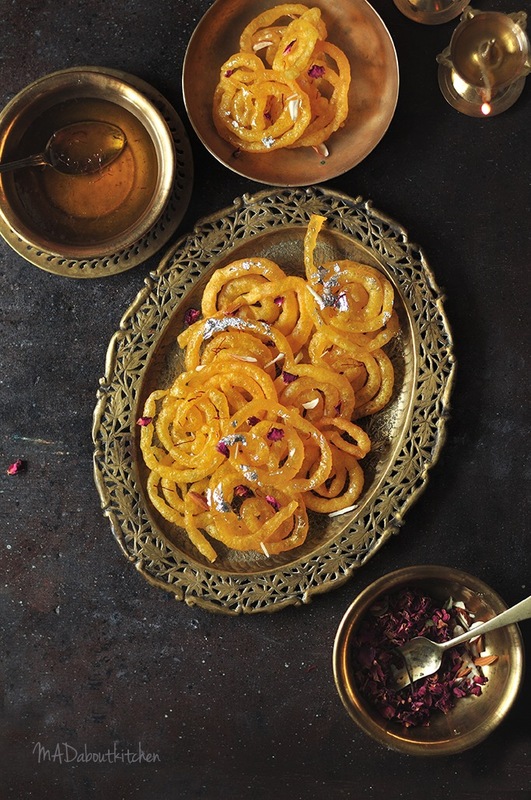 The key to perfect jalebi is the temperature of the oil while frying. It should be between medium and high. Around 180° to 190°C. If it is too low then you will get a flat jalebi and if it is high, then it spreads. Holding the squeeze bottle strainght , Starting from the centre start making swirls and fry them till it is light golden colour. Drop the hot jalebis into the warm syrup. Dip it well. Leave it there for 2 seconds and take it out. Repeat this with the remaining batter. 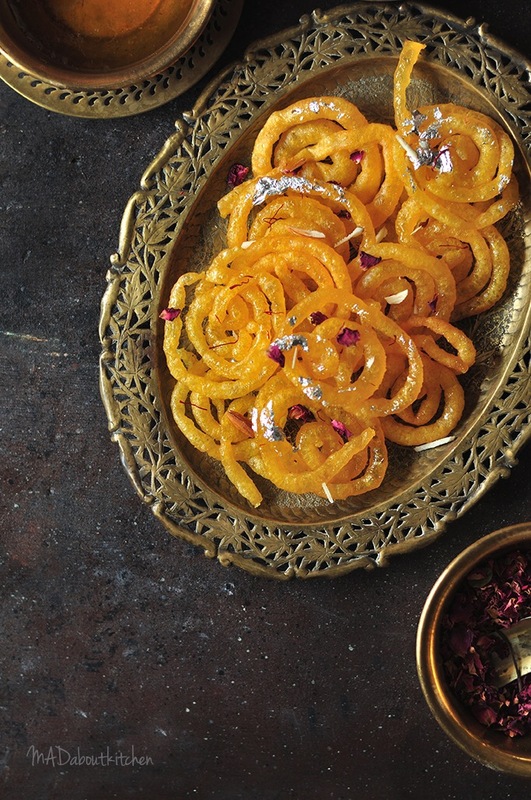 Put the soaked jalebis seperately till it cools down. 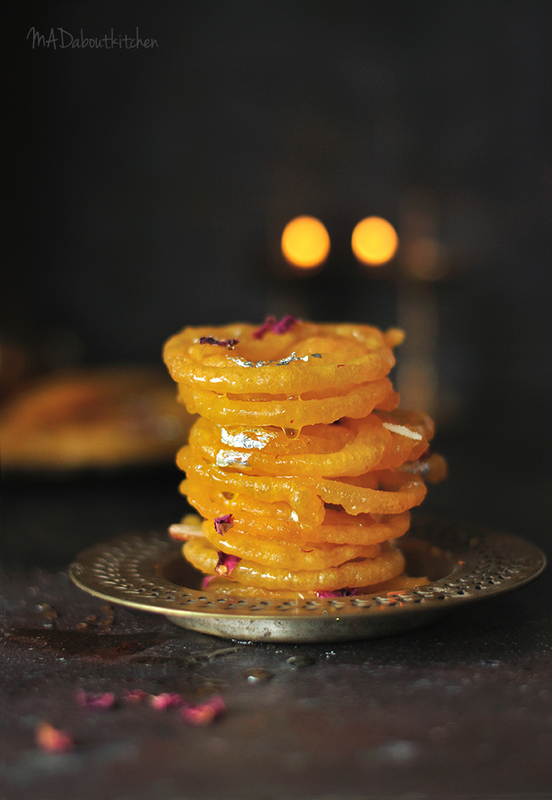 Put silver warq on it and garnish it with saffron and dry rose petals. Serve it immediately or serve it with rabdi. All the clicks are beautiful and the one in which the sugar syrup drips is absolutely stunning. Thanks for clicking such inspiring photos. People like you are a big encouragement to bloggers like me. Keep it up Madhuri.